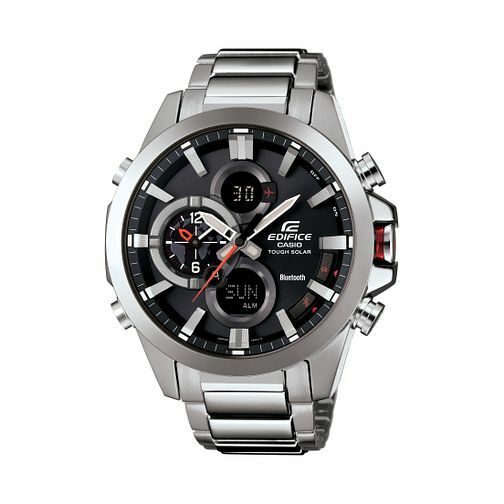 Seamlessly blending style and durability, this timepiece from the Casio Edifice collection promises a rugged design without compromising on precision timing. Crafted in stainless steel with a black dial, alarm function, tough solar and Bluetooth technology, this bold watch is perfect for the style conscious man who lives for the moment. Casio Edifice stainless steel bracelet watch is rated 5.0 out of 5 by 1. Rated 5 out of 5 by Anonymous from Excellent I had to add this to my watch collection, it isn't as pretty as the EQB-500DB-AER, but it is still a lovely looking watch nonetheless. I would recommend this watch, it also has a backlight which really does light up the whole face, when required. I really like this new range of casio Bluetooth time pieces, and i would buy them all if i could afford to.